What is a Ninja Foodi? The Ninja Foodi is a multi-function cooking appliance that crisps the outside of your pressure cooked food for a satisfying golden crunchy outside and tender inside. How well does it do all of these multi-functions? Here is my honest, unbiased detailed review. Continue reading to find out. How do you crisp the outside of pressure cooked, slow cooked, or steamed food? Until now, the only way to overcome the unappetizing look and texture of foods cooked this way was to brown/sauté them in a separate pot or pan on the stovetop. More work and more dirty dishes for you to deal with. However, now there’s another way. 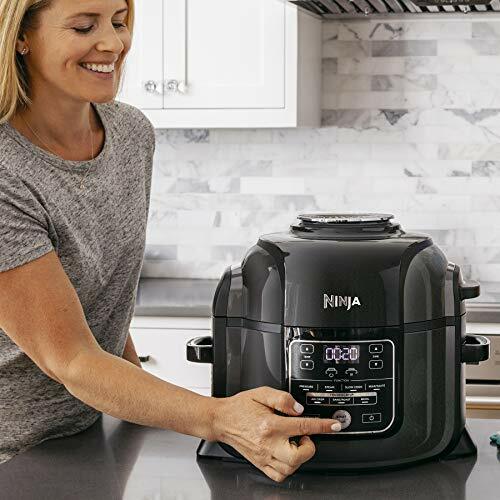 Faster, easier, and with only one pot to clean up, the Ninja Foodi turns into an air fryer that gives your food a tantalizing crispy exterior. And it does this without adding any fat or oil to your diet. The Ninja Foodi is a pressure cooker that cooks faster than many traditional cooking methods. You can cook from frozen to crispy without defrosting. Use it for one-pot wonders and add the extra flair of a crispy, bubbly layer on top. It also uses up to 75% less fat than deep frying. But, the results are tender, juicy insides and crispy outsides, just the way we like them. You will also love the cost savings from using less energy, cooking proteins, grains, and veggies at the same time. As well, cook with less expensive cuts of meat. Pressure cooking and slow cooking tenderize tough meats into savoury, juicy dishes. Two of the most important features of any small kitchen appliance that you need to think about first are its cooking capacity and physical size. What size is the best? Well, that depends on what you are going to be using it for the most. Is most of your cooking going to be for yourself or you and your significant other? Then small is good. A 1 to 3-quart capacity is about right for 1-3 people. However, too small and you will not be able to make a meal for visiting friends and family. If you don’t do this very often, perhaps buying two cookers might be an option. Do you have a small family of 4-6 persons? Then, a 6 to 8-quart capacity cooker is just right for you. If you often cook for a larger group, parties, get-togethers, and so on, then you need an extra large cooker or even two. In this case, I would also recommend getting two different kinds of cooker like a pressure cooker and a slow cooker or portable oven so you can make a variety of dishes at the same time. Don’t get too large a cooker. Cooking techniques change with the capacity of the device. For example, a small roast can be braised in a small pressure cooker but can only be boiled in a large one due to the amount of water required. The capacity of the Ninja Foodi pressure cooker pot is 6.5-quarts which is good for 4-5 persons and it also has a 4-qt Cook & Crisp™ pot suitable for 2-4 people. It will hold a whole 5-lb. chicken. Compared to an Instant Pot with the same cooking capacity, the physical size of the Ninja Foodi is larger and it is heavier as well. However, because it has the additional air fryer function, it takes up less space than these two appliances together. Another size issue is the air fryer lid. It does not come off and stays open when you are pressure cooking. This means that you cannot cook underneath a cupboard due to the extra height. The Ninja Brand is well known and well respected in the house-care field. It was founded in Montreal, Canada in 1998 but has since moved to Needham, Massachusetts. Some of its best known products are blenders and food processors. But, it also makes coffee and tea makers, as well as pressure cookers, air fryers, slow cookers and multi-cookers. The controls on the Ninja Foodi are simple and easy to learn. Power Off – used to shut the unit off and stop all cooking modes. Start-Stop – starts the unit after selection of temperature (or pressure) and cooking time. Also stops the function while cooking. Keep Warm – will keep the unit on at a low temperature for 12 hours. Keep Warm is automatically engaged after pressure cooking, steaming, or slow cooking. Temperature Arrows – is used to adjust the cook temperature and/or pressure level depending on the function. Time Arrows – adjusts the cooking time. Air Crisp – turns the unit into an air fryer. Bake/Roast – used the unit as an oven for tender meats, baked goods, and more. Pressure – is used for pressure cooking meals quickly while maintaining tenderness. Steam – gently cooks delicate foods at high temperature. Slow Cook – cooks food at a lower temperature over a longer period of time. Sear/Sauté – browns meat, sautés vegetables, simmers sauces, and more, just like a stovetop. A cookbook with 45+ recipes is included to help you with recommended temperature and time settings. And the thousands of recipes available for the Instant Pot work perfectly well with the Ninja Foodi. The Ninja Foodi has two pots to clean. Both the 6.5-qt. inner pot and the 4-qt. Cook & Crisp™ Basket are ceramic coated to prevent food from sticking. And the pots, silicone rings, detachable diffuser, and stainless steel reversible rack are all dishwasher-safe. The only components that require hand-washing with water and dish soap are the pressure lid, the pressure release valve, and the anti-clog cap. The 1400-watt base unit and attached crisping lid are easily wiped clean with a damp cloth. You can use the Ninja Foodi with full confidence in its 14 levels of safety having been tested extensively in order to obtain UL safety certification. The cooking pots are PTFE/PFOA-free, non-stick, ceramic coated for your health. Pressure cooking, steaming, slow cooking, and air frying are all healthy cooking methods using little to no oil. There are no fats or calories added as a result of cooking in these ways. Multi-Purpose Pan for creating bubbly casseroles, dips, and sweet and savory pies as well as baking fluffy, moist cake with a golden top. Standard warranty for the Ninja Foodi is a limited 1-year where they will pay for shipping a defective unit to them but charge US$19.95 to return the repaired or replacement unit back to you. This is better than some manufacturers’ 1-year limited warranties where you have to pay actual shipping costs both ways. Depending on where you live you could end paying more to ship the unit back and forth than the cost of a new one. But, it isn’t as good as others that are no hassle guarantees, paying for all shipping costs. Always read the warranty before you buy any product. Not all are created equal. Pressure cooking with the Ninja Foodi is easy. Place the pot in the base and add 3 cups of room-temperature water. Align the pressure lid with the arrow on the front of the base and turn clockwise until it locks into place. Turn the pressure release valve into the SEAL position. Press the PRESSURE button. Default setting is HI pressure for 2 minutes. Adjust pressure and time as required by your recipe. Pressure will build indicated by rotating lights on the control panel. When fully pressurized the timer will begin counting down. When finished, the Foodi will beep and automatically switch to the Keep Warm mode and the timer will begin counting up. Natural Pressure Release: When pressure cooking is complete the unit will cool down and release pressure naturally. This can take up to 20 minutes depending on the level of liquid and amount of food in the pot. This will happen in the Keep Warm mode. When the pressure release is complete the red float valve will drop down. Quick Pressure Release: ONLY use quick pressure release if your recipe calls for it! When pressure cooking is complete and the KEEP WARM light is on, carefully turn the pressure release to the VENT position. Steam is hot and can burn skin, so keep your hands clear of the vent while steam is being released. Even after pressure is released, either naturally or quickly, there will be some steam left in the unit. Lift and tilt the lid away from you while opening. And make sure condensation is not allowed to drip into the cooker base. TenderCrisp™ Technology – How Does It Work? TenderCrisp Technology™ injects moisture and locks flavor into your meals using super-heated steam. Then the crisping lid quickly circulates hot-air down and all around the food. A crisp, golden, appetizing outer layer is created. Pressure cooked, steamed, and slow cooked food comes out with the color, texture, taste, and look of deep fried or oven-roasted dishes. But, your meal is healthier because added fat and calories due to cooking with oil are avoided. Find out more about how air frying works here at Wikipedia. Press the AIR CRISP button. Use the up and down TEMP arrows to change the default temperature setting displayed on the control panel. Temperature can be adjusted between 300°F and 400°F. Adjust the TIME with the up and down arrows to set the cooking time up to 1 hour in 1-minute intervals. Install the bot and place either the Cook & Crisp™ Basket or reversible rack in the pot. Ensure that the diffuser is attached for the Basket. Preheat the unit for 5 minutes before adding ingredients. Add ingredients to the Basket or rack and close the lid. Press the START/STOP button to start the cooking cycle. Once in a while you may open the lid and lift out the Basket to shake or toss the ingredients for even browning. After you put the Basket back into the pot, close the lid and cooking will automatically continue. When the time reaches zero, the unit will beep and stop cooking. In order to slow cook using the Ninja Foodi it is not necessary to pressurize the unit. Add ingredients to the pot making sure not to fill above the MAX line. Assemble the pressure lid by aligning the mark on the lid to the mark on the front of the base. Then twist clockwise until the lid locks into place. Turn the pressure release valve to the VENT position. Pressure the SLOW COOK button. Use the up and down TEMP arrows to select HIGH or LOW. Use the up and down TIME arrows to set the cook time up to 12 hours in 15-minute intervals. Press the START/STOP button. The unit will begin cooking. When cooking time is completed the unit will beep and automatically enter Keep Warm mode. Place the cooking pot into the base. Press the START/STOP button to begin cooking. Press the START/STOP to turn off the sear/sauté function. Or you can press any other function button to immediately switch modes. You can use the SEAR/SAUTÉ function with the crisping lid open or with the pressure lid closed with the pressure release valve in the VENT position. Steaming food is a very healthy way to keep nutrients in your veggies and other tender food like fish and seafood. Use your Ninja Food to steam your favorites. Add at least 1 cup of liquid (or as required by your recipe) to the pot. Install the pressure lid aligning the mark on the lid to the mark on the base and turning CW until the lid is locked. Turn the pressure release valve to VENT. Press the STEAM button. Use the ups and down TIME arrows to set the cooking time up to 30 minutes in 1-minute increments. Press the START/STOP button. The unit will preheat to bring the liquid to a boil. During this time rotating lights will be displayed on the control panel. When the unit is at the proper temperature the timer will start counting down. When the timer has finished counting down the unit automatically switches to Keep Warm mode. It the red float valve is popped up, wait for it to drop so that you can open the lid. Press the BAKE/ROAST button. Adjust the displayed default temperature, as required by your recipe, by pushing the up or down TEMP arrows. A cooking temperature between 250°F and 400°F can be used. Adjust the cooking time using the TIME up and down arrows in 1-minute increments up to 4 hours. If you wish to adjust the time after 1 hour of cooking, time is increased by 5-minute increments up to 4 hours. Preheat the unit for 5 minutes before adding ingredients for best results. Add ingredients to the pot. Close the lid and press the START/STOP button to begin cooking. When the cooking time is complete, the unit will stop and beep. Press the BROIL function button. Use the up and down TIME arrows to adjust cooking time up to 330 minutes in 1-minute intervals. Insert the reversible rack in the upper broil position the cooking pot. Place the ingredients on the rack and close the lid. Press the START/STOP button to start cooking. When cooking time is complete, the unit will beep and stop cooking. Multi-functional – replaces four appliances in your kitchen and the only device (at this time) that is both an air fryer as well as a pressure cooker. Healthy – cooks with up to 75% less fat than deep frying in oil. Easy to use – simple controls, easy to understand display. Easy to clean – most parts dishwasher-safe, only a few small parts that require hand-washing. Efficient – cooks faster and with less energy than conventional stoves and ovens. Convenient – cook one-pot dishes or cook all ingredients at the same time using the Cook & Crisp™ layered insert. More expensive than an Instant Pot but less expensive than and Instant Pot plus an Air Fryer. Ninja Foodi – What Can You Make With It? Ninja Foodi – Who Is It For? The Ninja Foodi is for those of you who love the healthy and convenient aspects of pressure/steam/slow cooking but also want the texture and appearance of deep fried food. And want to only use one appliance to achieve it. The Ninja Foodi combines the best of both worlds. Get that crispy outside and tender inside that you crave without the guilt of deep frying. This is the first, and so far only, multi-function cooker to add Air Frying to its arsenal of features. And it performs all of its functions with excellence. If this is you then the Ninja Foodi is what you want. If not, then have a look at some other options on my post, 12 Best Instant Pot and Programmable Multi-Cookers of 2018. For innovation, ie. the combining of Air Fryer function with a multi-function Pressure Cooker, Steamer, and Slow Cooker. For high quality, versatility, durability, and superior performance I give the Ninja Foodi a 93 out of 100 and a very highly recommended Buy. If you found this article informative and interesting, please leave your comments, questions or opinions in the Comment Box below. Feel free to share this post with others via your favorite social media. Just click on the relevant icon below. And don’t forget to subscribe to my weekly updates and news. Submit your name and email at the upper right of this page. You will not be bombarded with spam or junk email and your personal information will never be shared with anyone.